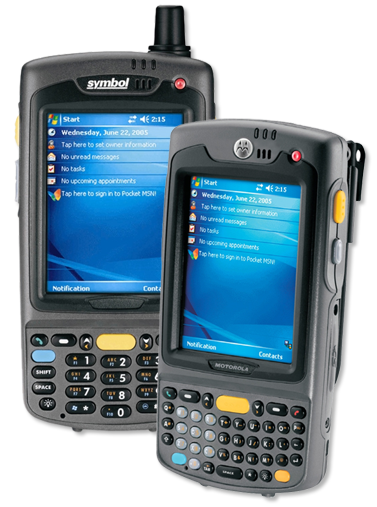 Our refurbished Motorola MC7090 (refurbished Symbol MC7090) Enterprise Digital Assistant (EDA) is a rugged handheld mobile device that incorporates a mobile phone, PDA, computer, scanner and imager in a single unit designed for the rigors of all-day, everyday usage. The compact, lightweight Motorola MC7090 (Symbol MC7090) combines multi-mode wireless networking, voice and data communications, and advanced data capture in an enterprise productivity tool that can support nearly any application in any environment. Contact us today about buying, servicing, renting or selling Motorola MC7090 (Symbol MC7090) gear! Our refurbished Motorola MC7090 (refurbished Symbol MC7090) features superior voice functionality includes outstanding acoustic performance and voice quality, handset, headset and speakerphone modes. Your mobile workers will have everything they need to increase productivity and efficiency inside and outside your four walls — from field workers reading meters and repairing equipment to drivers delivering packages, hospital workers checking lab results and medication orders, and more. Contact us today about buying, servicing, renting or selling Motorola MC7090 (Symbol MC7090) gear!